There are certain rituals involved in getting ready to go back to college - sorting, packing, saying goodbye to local friends...and sending your Mom to Costco for essentials like pita bread and brownie bites. While I was at Costco today I discovered that Christmas has arrived already! There are Christmas lights and decorations starting to fill the aisles. One of my favorite bargains at Costco is the wired ribbon. 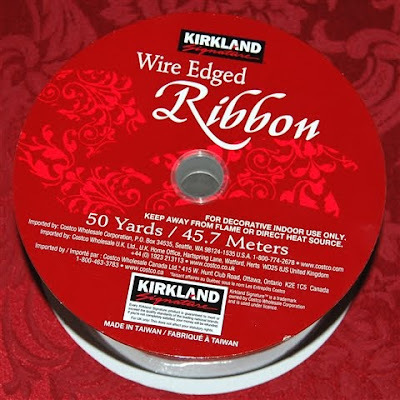 There are all sorts of lovely designs and the price is so reasonable - a 50 yard spool of wired ribbon is only $6.89! 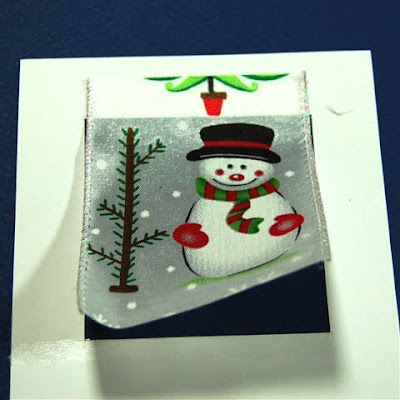 I saw this snowman patterned ribbon and immediately had an idea for Christmas cards - I couldn't wait to get home to try it (when I should have been finishing the back-to-school laundry!). 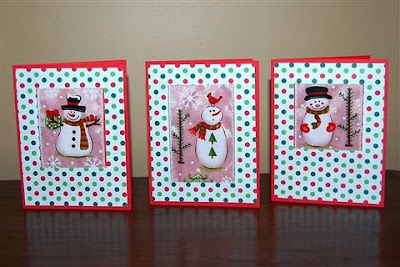 There are three different snowmen with some trees and snowflakes. 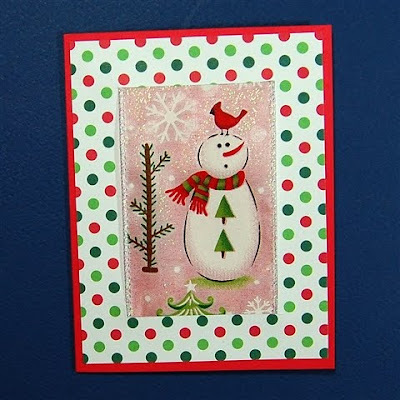 I cut segments of ribbon centered on each snowman to use for my cards. I cut some 12 x 12 paper to three pieces - two sections at 5.25 x 12 inches and a leftover strip of 1.5 x 12 inches. I ran the 5.25 x 12 inch pieces through my DreamKuts to create three four inch wide sections. 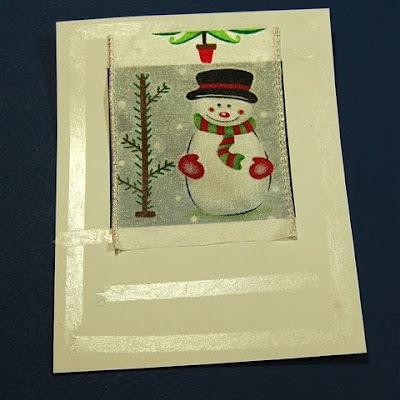 This paper is from an American Crafts Christmas pack I found at Tuesday Morning in Connecticut on our last trip. 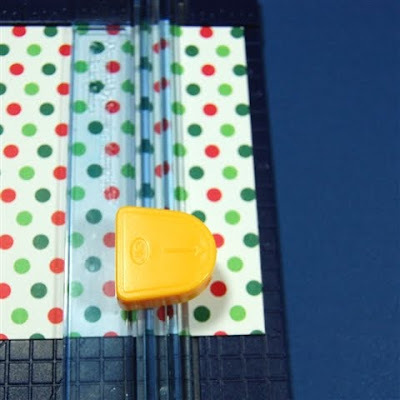 I used my Creative Memories trimmer to cut out a window. Most trimmers have an arrow to indicate the blade position and by aligning this with the grid on the base you can make interior cuts. Here is my card layer with the center cut out removed. (Of course, you save these centers for other projects). I applied tape to the top and bottom edges off the opening. Then I placed my snowman ribbon strip on the tape at the top, being careful to keep the sparkly wired side edges exposed in the window. I smoothed the ribbon over the tape at the bottom of the window and then added tape all around the layer. I layered the ribbon front on a red A2 card. Simple and quick! I could add a sentiment in the lower section or just leave the front as it is and add a greeting inside the card. The ribbon is sheer and sparkly and really catches your eye in the light. The glittery wired sides also add a lot of sparkle to this design. You could put a paper frame around the opening or ink it but I like it plain and simple. 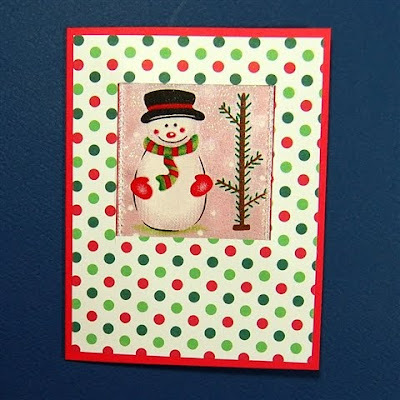 I was able to quickly make a card with each snowman. On this one I miscalculated my cut and it is about 1/4 inch too low at the bottom - when I do the next one the tree top will just peek out with the star showing. Here is the third version - each card has a slightly different sized opening in the top mat. I thought about making a Design Studio file to cut the layers and openings but I think it is easier and more precise to do these the "old fashioned" way. 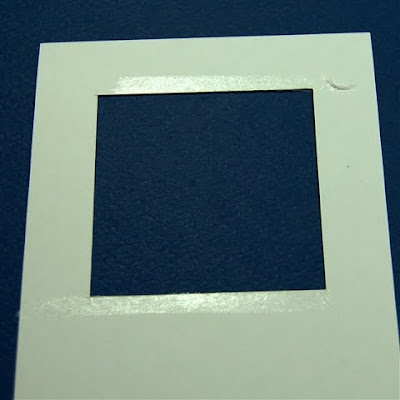 Due to slight differences in mat loading and machine calibration it would be nearly impossible to get the openings perfectly centered using the full 12 x 12 sheet. Aso, you would have to hand trim at the edges of the mat to complete the cuts once they reached the "no-cut zone." Cutting these by hand makes it possible to make small adjustments to get evenly spaced results and maximize the use of your paper. 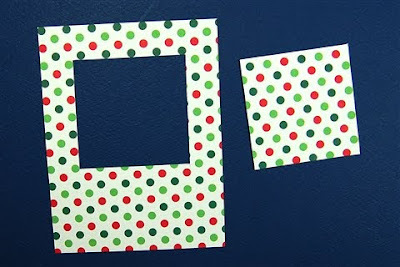 These were fast to make, the materials are inexpensive and they are cute - three good things! I counted nine snowmen per yard of ribbon so this spool would have 450 sparkly ribbon images to use for the cards at a cost of about one and a half cents for each snowman. 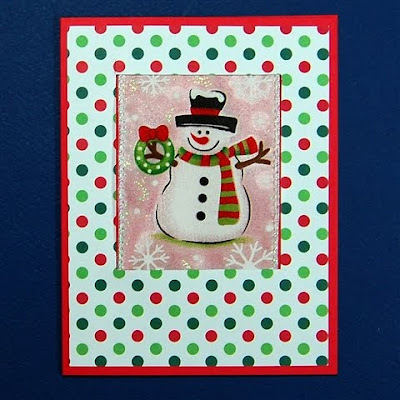 It is pretty hard to find an embellishment that can carry a card front for only 1.5 cents! One piece of 12 x 12 paper will yield six layers for the fronts. I got paper in a pack at a reduced price but if you figured on 60 cents for a sheet of good quality patterned paper the cost would be 10 cents for the layer. For the A2 card base I cut an 8 1/2 x 11 piece of cardstock in half - Papertrey Ink sells lovely 8 1/2 x 11 cardstock at 50 pieces for $9, so the average cost per card is nine cents. 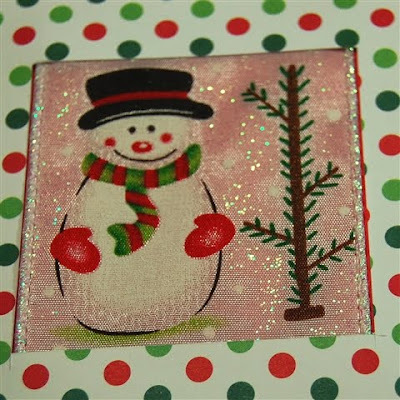 Add an envelope for about 15 cents and even if you add a liner or some Stickles or other embellishments to the card your total cost per card is less than 50 cents. Now I guess I should go finish that laundry! 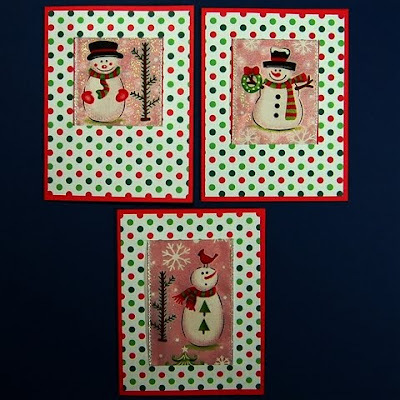 Super cute Christmas cards!! what a great idea to use that fabulous ribbon, I bet the texture looks amazing too! Great idea! Love it and will most likely try it! Got to go shopping for some ribbon though. :) Thanks tons!I just started my laundry for the day too...not much this week thankfully. Take care and have a wonderful weekend. You are one clever gal!! I love this idea!!! These are adorable, and so great for mass producing. Thanks for always being there with the great ideas! Diane, I saw this ribbon, but not being very creative, I never thought to use it this way. What a neat idea! Thanks for sharing your cards. unfortunately we don't have a costco in our area, and i just love that ribbon. wonder if j's or m's might have it. i'll be checking! love how you calculated the overall cost factor. i do that alot too.